When Shelter in Place went beyond our original Kickstarter goals, one of the questions I wrestled with was how to reward our supporters. We wanted to do something special, some extra for them to show how much it meant to us to hit 200% of our goal. In the end, we decided to do one of our favorite things – put together another book. Gimme Shelter was really a chance for me to work with friends and writers that I admire on a project very dear to me. I got to produce a book that is essentially a love letter, to horror, zombies and the apocalypse. Since the Kickstarter Gimme Shelter was only made available to our supporters. One of the main questions I’ve been getting asked these past few months is by people who missed the Kickstarter but still want the book. Well, today is the day they can get it. 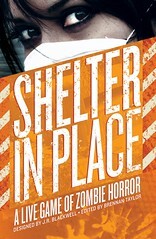 Gimme Shelter, the anthology of the zombie Apocalypse, is now available! Gimme Shelter is about zombies, survival, fathers and daughters, teenagers making out, guns, awkward third dates, reality TV gone wrong, and having a sense of humor in the face of impending disaster. Gimme Shelter features all-new fiction from Filamena Young, Jared Axelrod, PJ Schnyder, Christiana Ellis, Peter Woodworth, Tee Morris, Mur Lafferty, Rob Wieland, David A. Hill Jr., Phillipa Ballentine, Chuck Wendig, and J.R. Blackwell.